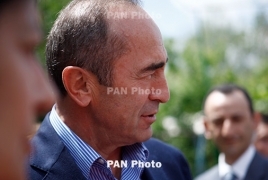 Late Azerbaijani president Heydar Aliyev has at one point negotiated the settlement of the Nagorno Karabakh conflict with then President of Karabakh Robert Kocharyan, Armenian Prime Minister Nikol Pashinyan said in Strasbourg on Thursday, April 11. In response to accusations of “occupying” Karabakh, the Armenian Premier said people who currently live in Karabakh, were born there, the same land where their ancestors lived for ages. “How can you occupy the land you are living on and where your children are going to live one day?” Pashinyan said.